Caption: A recent photo of the Shrivers taken at the Press Conference announcing that the 2007 Special Olympics will be held in Shangai. Sargent Shirver is shown on the right. Eunice Kennedy Shriver, the founder of Special Olympics is shown in the Center. 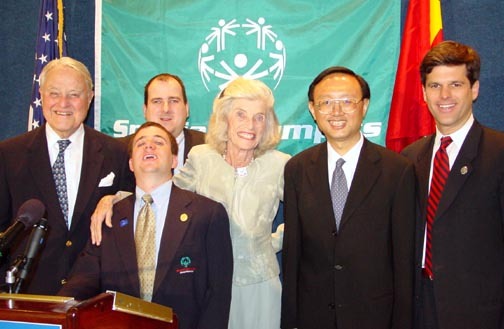 Timothy P. Shriver, president and CEO of Special Olympics, is shown on the right. His Excellency Yang Jiechi, ambassador of the People's Republic of China to the United States, is shown second from the right. Read and comment on this story from the Wall Street Journal on the special legacy of Eunice Kennedy Shriver and Sargent Shriver. Last week the 87-year-old Sargent Shriver, in a letter to friends (by definition, therefore, a mass mailing) revealed that he has been diagnosed with the early stages of Alzheimer's. This is a man who has lived a rare life: he has been a war hero, a businessman, launched the Peace Corps and Head Start and Legal Services, served as ambassador to France, vice presidential nominee, chairman of Special Olympics and father of five terrific kids. There was no sadness or nostalgia in this letter; as always Sarge Shriver was upbeat, optimistic, focusing on the future. "From my point of view, this disease means one thing, and one thing only: My memory is poor." Tim Shriver inherited something more valuable than a famous name or family fortune: Eunice Kennedy Shriver and Sargent Shriver's values. As young Mr. Shriver prepares to preside over the quadrennial Special Olympics in Dublin, starting this weekend, the energy and ideals, commitment and compassion of his parents are omnipresent. His mother founded the Special Olympics in 1968 and Sargent Shriver is the current chairman. The 12th games -- the first held outside the U.S. -- will feature 7,000 athletes from over 150 countries, including eight from Iraq -- participating in 21 sports. Worldwide, there are more than one million participants in the Special Olympics, the largest disability-rights group. Over breakfast last week, before departing for Ireland, Tim Shriver talked about the need to change attitudes around the world, to persuade people that many with mental disabilities can be contributing members of society. "There's still too much of a shame and stigma." To be sure, the Special Olympics has helped alter those views. "We find that anyone who has contact with Special Olympics or any of our community-based experience comes away with a positive attitude about people with mental disabilities," says Mr. Shriver, president of the organization. The Dublin Olympics is only the culmination of the activities of Special Olympics chapters around the globe. "There's a misperception that this is a every four year thing; Special Olympics is every day," says famed investor Peter Lynch, a board member. "It's about kids and adults every day playing ping pong, bowling, roller skating." Mr. Lynch has an intellectually disabled brother; life would have been better, he says, if there had been a Special Olympics organization when they were growing up: "It does so much for self-esteem." At a private White House dinner President and Mrs. Bush held for the Special Olympics a year and a half ago, Mr. Lynch told a story that captures that spirit. A state trooper (police officers often are special Olympics volunteers) was running around the track with a mentally disabled youngster; he kept going faster and the young man kept up. After a while the trooper exclaimed, "You're really good!" The kid replied: "You're really good!" After they finished, the youngster's mother told the trooper those were the first words her son ever spoke. There are 170 million people with an intellectual disability in the world. Recently, in tandem with The Center for Social Development and Education at the University of Massachusetts and the Gallup organization, Mr. Shriver's organization conducted the first comprehensive survey of attitudes about intellectual disabilities. It was done in 10 countries on five continents. Not surprisingly -- in large part due to the Shrivers and Special Olympics -- the U.S. has the most enlightened views. Here and in other first world countries like Japan and Germany, large majorities believe the intellectually challenged easily can handle routine tasks like washing and dressing or telling time or sustaining friendships. Moreover, there is a widespread view that insufficient resources are devoted to the issue. But the overwhelming conclusion of this survey, notes Gary Siperstein, director of the University of Massachusetts center, "is the misperception so many people have about mental retardation. In most countries people see individuals with mental retardation as severely impaired when, in fact, there is a wide range." In some places, the attitudes are appalling; only 5% of Egyptians believe that people with intellectual disabilities are capable of understanding news events. And even in the most advanced cultures, including the U.S., most respondents don't believe the mentally disabled should be integrated into the skilled workforce, or attend regular schools or enjoy independent (even if supervised) living. The most egregious misperception may be a widely accepted view that those with mental retardation either get better or the same health care as the rest of the population. The impact of Special Olympics, however, is evident: majorities or pluralities in every country believe individuals with intellectual disabilities are very capable of playing sports, a finding that certainly would have been different 35 years ago. The survey, Mr. Shriver says, crystallizes his sense of the need to expand the mission to better educate people. "Ignorance is the source of many of these problems," he notes. "It's time to think bigger about this movement, to sharpen the challenge." He's talking to several prominent experts with experience in other international organizations about how to launch such a movement and also has the special counsel of his parents; his dad will be stepping down as chairman of the organization after the Dublin games. Last week the 87-year-old Sargent Shriver, in a letter to friends (by definition, therefore, a mass mailing) revealed that he has been diagnosed with the early stages of Alzheimer's. This is a man who has lived a rare life: he has been a war hero, a businessman, launched the Peace Corps and Head Start and Legal Services, served as ambassador to France, vice presidential nominee, chairman of Special Olympics and father of five terrific kids. There was no sadness or nostalgia in this letter; as always Sarge Shriver was upbeat, optimistic, focusing on the future. "From my point of view, this disease means one thing, and one thing only: My memory is poor." This profoundly spiritual and ebullient man then proceeded to outline his future plans: to finish an autobiography, to think and write more about religion and politics, to spend more time with his 15 grandchildren and continue to celebrate life with his remarkable wife: "I would gladly scrap any work on my own simply to watch her in action." So as the Dublin games are celebrated, let's pay special tribute to the Special Olympics chairman and the shining inspiration he is for his son as well as the millions of individuals with disabilities around the globe.